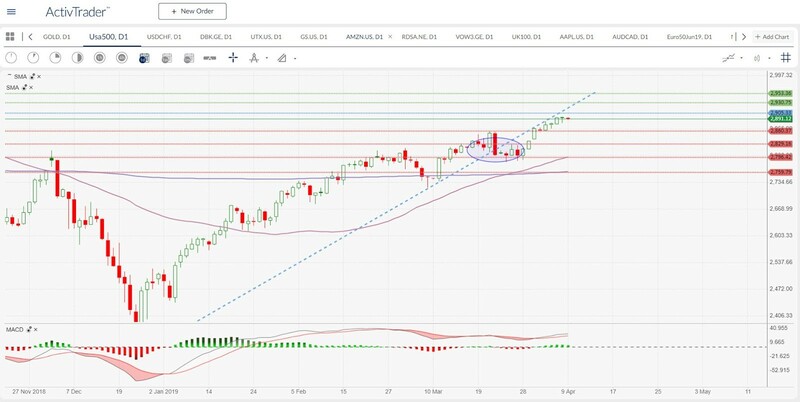 S&P500 – has the bull-run ended? Wednesday could be the start of an exhilarating week in the financial markets. It starts in the early morning at 06:30 GMT with the address from BoJ Governor Kuroda. At 11:45 GMT there is the ECB Interest Rate Decision, and then at 12:30 GMT the ECB Monetary Policy Statement including press conference follows. At 16:00 GMT, there is the European Council Summit on Brexit, followed at 18:00 GMT by the FOMC Minutes. At 01:30 GMT on Thursday morning, the Chinese Consumer Price Index will be released. Then at 06:00 GMT on Thursday the German Consumer Price Index comes out. Finally, on Friday, the Brexit Deadline will expire. All in all, a turbulent week! The S&P500 has done very well over the last four weeks and has seen the highest prices in almost half a year. The question now is whether the air has gone out of the run or whether the bulls have the strength to drive the market higher? The market fell below its upward trend line with the March 22nd candle. From here on, the market was able to recover, but so far its recovery has stayed below this upward trend line. The S&P500 has not yet managed the significant jump back above the trend line. The area around 2900 points could be crucial in the coming days. The first question is, will the market be able to get close to this line and then overcome it sustainably, or will the bulls run out of steam by then? If the market overcomes the 2900 point range, new highs could follow. The areas around 2930 and 2950 could provide resistance, making it more difficult for the market to climb higher. However, if the bull-run is ended, and the bears take charge, then the first support might be waiting in the 2860 area. If this is too weak, further support zones at 2830, 2795 and 2760 could support the market. The two moving averages SMA 50 and SMA 200 have formed a bullish intersection. The MACD, on the other hand, is relatively flat. Although the MACD line is above its trigger line, which is positive, the distance between both lines is relatively weak, and the lines are almost horizontal, so this signal needs confirmation. On the political side, this week could see much impetus for the market, which could give the market clarity.